Curry comes of age, Manu silences doubters and Slade is the man. But can England match this intensity and why you shouldn’t sleep on Ireland. What a difference 80 minutes can make. If the rest of the world were sleeping on England despite their success in November, they will be up and awake this morning following a stellar performance from Eddie Jones’s charges. Arguably, yesterday’s 32-20 victory in Dublin was the most complete performance from this England side under Jones, dismantling an Irish side in booming health on home soil. The heart of this winning performance can be found in the returning figures of the Vunipola brothers in the pack and the presence of a rarely fit Manu Tuilagi in the midfield; the latter of whom silenced those questioning his ability to play at inside centre for England, myself included. The presence of lineout guru George Kruis in the engine room alongside the colossal Maro Itoje and the breakdown work of starting flankers Mark Wilson and Tom Curry smoothed the edges of a previously rough looking team. Yesterday’s performance reminded the world that, in the great Sam Warburton’s own words, “whilst many aspects of the game are vitally important, we play a collision sport, where aggressive defence, contact area and pure physicality wins games.” The sheer size of a first-choice pack was blended perfectly with an added urgency around the contact and breakdown area, where Mako Vunipola, Kyle Sinckler, Wilson and Curry quashed the inadequacies that plagued England in 2018. Equally, Owen Farrell’s return to his natural position of fly-half and Elliot Daly’s attacking presence at fullback transformed the English offensive offerings. To put the gravity of England’s gain line success into a neat pile of numerical values, Jones’s men achieved 48 dominant collisions, where Joe Schmidt’s side managed just eight in comparison. Heading into the fixture, questions loomed over three of England’s most complete performers. A centre combination of Tuilagi and Slade raised doubts while some concern was laid upon the potential difference in Test physicality between injured Bath man Sam Underhill and Sale Sharks 20-year-old openside Tom Curry; the latter of whom silenced his doubters in a complete showing in Dublin. Tuilagi’s lack of experience playing at inside centre and Slade’s past inconsistencies whilst donning the Rose could well have stood as areas of weakness for England yesterday, but the new-look midfield pairing turned out to be two of their side’s most influential performers. Bagging a brace of scores, proving a handy kicking threat and a pillar of England’s defence, Slade may well have done enough to ink his name onto England’s Rugby World Cup team sheet at number thirteen. The Plymouth-born playmaker has gone from one of the national side’s most inconsistent performers to a Conrad Smith-type presence within England’s freshly balanced backline. Concerns placed upon Tuilagi’s colossal shoulders came in the form of his defensive decision-making whilst shifted in from his usual position at outside centre, often displaying a tendency to shoot out of the line to make dominant collisions. However, the Samoan-born centre went toe-to-toe with opposite man Bundee Aki and managed to find himself on an outside arc on one occasion, enjoying the best of both worlds while providing the backline with vital ballast. With Ben Te’o expected to return to fitness over the next few weeks, England’s midfield dilemma looks to be over. When it comes to the now nullified question of Curry’s physicality, the Sale Sharks flanker provided one of many key moments on the gain line during England’s victory. In the 53rd minute, Curry put in a dominant collision on Ireland’s 126kg British and Irish Lions tighthead prop, Tadhg Furlong, denying the visitors crucial momentum at a time where they found themselves seven points down and enjoying a spell of hard-earned possession in England’s 22; position afforded the home side by a well-placed kick in-behind the English defence and a forced knock-on from Slade. Below we can see Curry take Furlong head-on, losing no ground and halting the Leinsterman dead in his tracks, allowing the recently arrived Courtney Lawes to come in and knock Furlong backwards from a stationary position. Curry then goes on to latch onto the ball for a brief moment before being told to release by referee Jerome Garces, denying Conor Murray quick ball and allowing England’s defence time to set and number up. An eye-catching moment, but one the youngster created on multiple occasions. Can England match that intensity? But for all the admiration we must pay to England’s terrific victory in Ireland, the matter of their durability must be discussed. If Jones’s side can turn up to every big match this Six Nations, and during the World Cup, and produce this level of intensity and accuracy, they may well be on course to compete for silverware. However, their mental stamina will be tested more than ever over the next two weeks. The French travel to Twickenham next Sunday while a trip to the Principality to face a vocal Welsh outfit beckons a fortnight later. The most significant challenge will come from the Welsh side that, in Warren Gatland’s own words, has forgotten how to lose. But don’t sleep on Ireland. Yesterday’s performance from Schmidt’s green machine is a rare sight and one perhaps borne of the pressure of heading into the championship as clear favourites and one of, if not the, best sides in the world. 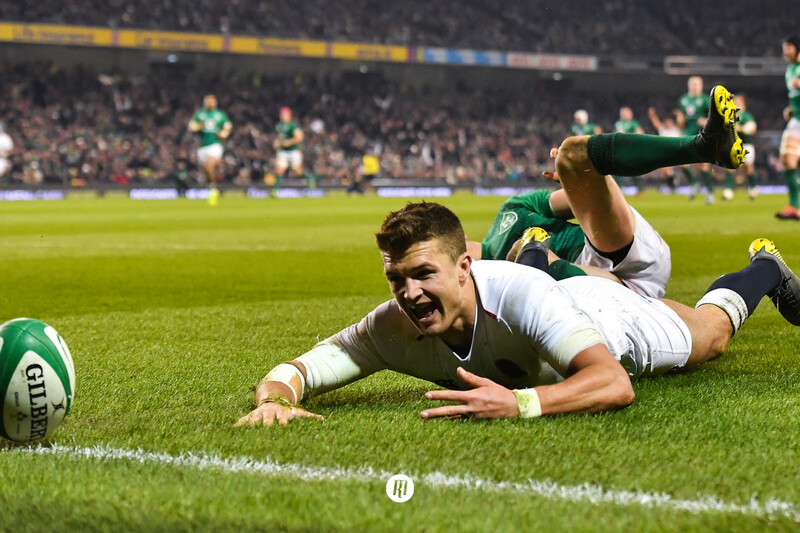 The Irish are never better than after a deflating performance, and especially at the hands of the likes of New Zealand or England. Schmidt is one of the most intelligent minds in rugby and will surely have a trick or two up his sleeve to spur on his charges, reinforce the areas England exposed and potentially, find another dimension to his side.